Discover over 100 recipes to help you overcome your difficulties with C++ programming and gain a deeper understanding of the working of modern C++. Claim this full 590 page eBook and start improving your C++ code today. 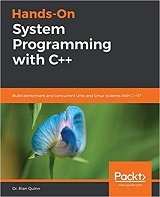 If you want to overcome difficult phases of development with C++ and leverage its features using modern programming practices, then this book is for you. The book is designed for both experienced C++ programmers as well as people with strong knowledge of OOP concepts. Authors show you how the process works and what it takes to build and apply a basic metaprogramming toolbox. Then comes the real payoff: you'll learn about a set of existing metaprogramming techniques you can use to perform fast and precise metaprogramming tasks without error—including the Boost.MPL, Boost.Hana, and Brigand libraries. Extend your C++ knowledge and take your development skills to new heights by making your applications fast, robust, and scalable.